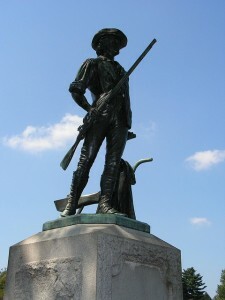 This Patriots’ Day week, we mourn for the victims of the explosions in Boston. I’m not a native Bostonian, but I’m a Bostonian now: my emotions have fluctuated between deep sorrow and deep anger that someone would do this to my city, to my fellow Bostonians. I’m so thankful for our police officers, firefighters, National Guard, and all the first responders. Two lanterns in the still-silent gray of dawn. By the rude bridge that arched the flood. He rode to the next house, and the next, and the next. Their flag to April’s breeze unfurled. To give them all—Death to Tyranny! Here once the embattled farmers stood. Sent the minute men to the hill to watch them come. So they advanced on the bridge, but did not fire. Two Patriots fell, but still they advanced on the bridge.